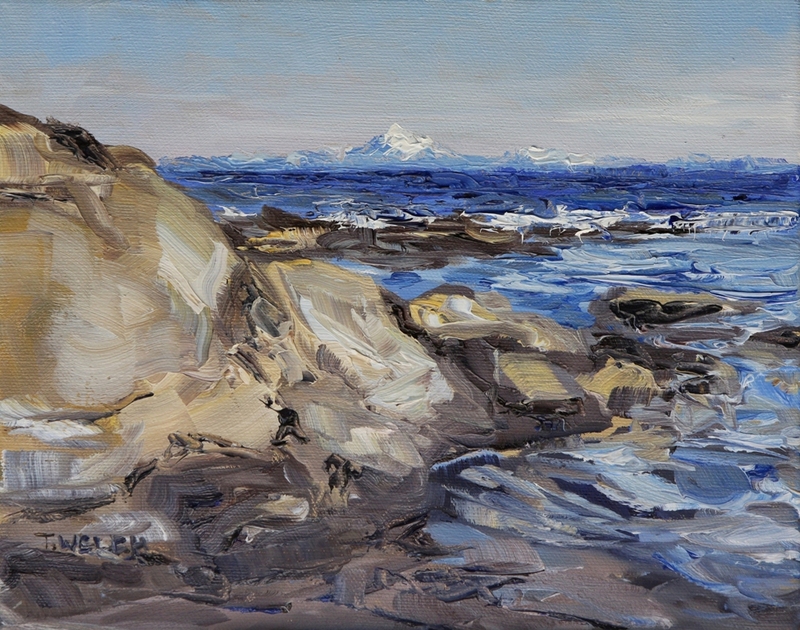 There is something about coming to the Mayne Island shore and seeing Mount Baker across the Strait of Georgia that is like magic. No photograph seems to adequately capture my surprise and delight so I took the task to my canvas instead. THE MT. BAKER REACH 8 x 10 inch oil on canvas is sold to a private collector in California. I am off to find the perfect box to get it ready for the post. Beautiful painting. Baker is amazing some days. I remember my children once running down to the beach, then they simply stopped dead, and stared at the mountain in amazement. I still do that sometimes Deb it just has this wonder presence when it is large and bright across the water.